From Jim Kaler's STARS Pages. Second magnitude Polaris, Alpha Ursae Minoris, of Ursa Minor (at the end of the handle of the Little Dipper) is smack in the middle of the picture, which is 6.0 degrees across. Yildun, Delta UMi, is the bright star at upper right. Lambda UMi (a red giant, note the color), lies in between them. The star immediately down and to the right of Polaris is HR 286, while 24 UMi is just down and to the left of Yildun. 2 UMi, which is actually in Cepheus, is the bright star at the lower edge to the right. OV Cephei, actually in Cepheus proper, is at the far left edge just above center. HR 1107 (Cepheus) is the brighter of the two stars down tward the lower left corner. HR 306 and HR 8938 are the two brighter stars to the right of HR 1107, while HR 4686 lies near the top edge just to the left of center. The ragged circle of faint stars down and to the left of Polaris is called the "Engagement Ring," with of course Polaris as its shining stone. The North Celestial Pole (for the year 2000) is just to the left of the center of the line between Polaris and Lambda. Polaris is right at mid-second magnitude. Lambda (at magnitude 6.4) and HR 286 (6.5) are near the limit of naked-eye vision. The faintest stars in the picture are 10th magnitude. See the expanded image (rotated through 180 degrees). Star name (NAME, linked to the star's story) by proper name, Greek letter name, Variable star name, Flamsteed number, or HR number in the Bright Star Catalogue. HR 4686 UMi 6.28 F2 V 152 2.94 5.2 Gamma Dor variable; part of the "English Rose"
While a dark sky seems filled with stars, they are not all that densely packed. The number of naked-eye stars depends critically upon local conditions and eyesight. The Bright Star Catalogue lists around 9000 stars brighter than magnitude 6.5, the nominal (and really extreme) cutoff. The whole sky has an angular area of about 42,000 square degrees, which results in 0.2 stars per square degree, or about 5 square degrees per star. By way of comparison, the full Moon has an angular diameter of half a degree and an angular area of 0.2 square degrees. The odds of the Moon covering a naked-eye star is then about one in 25 -- it just does not happen that often. This Polar Star set shows the same thing. The area in the polar picture contains 36 square degrees and therefore 11/36 = 0.3 naked eye stars per square degree, a bit above the average because the region is relatively close to the Milky Way in Cepheus. 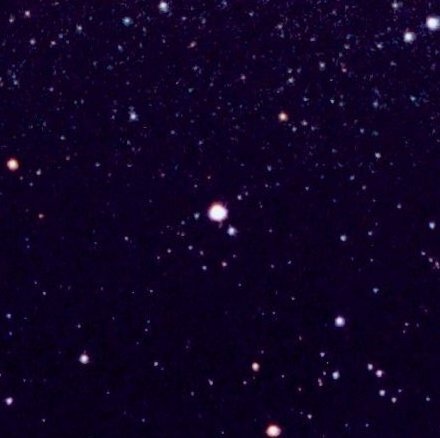 In this rather random sample of stars, there is one star of second magnitude, none of the third, two of the fourth, one of the fifth, and seven of the sixth. 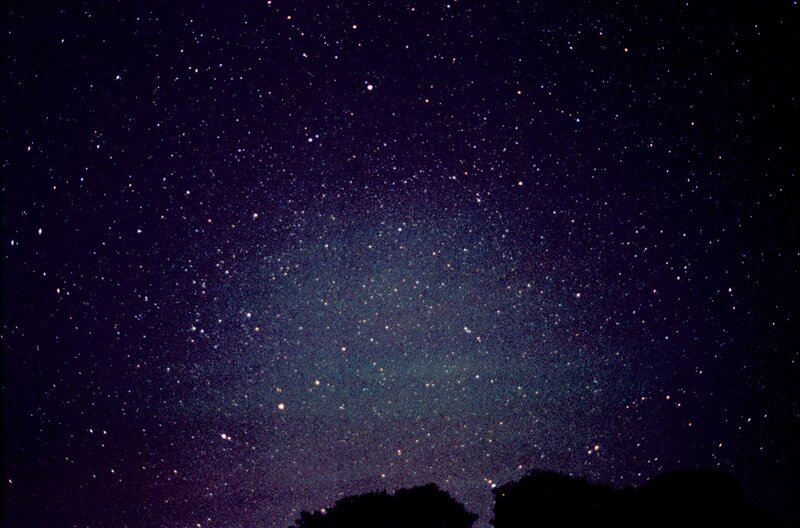 Over the whole sky, the numbers of stars climb smoothly with increasing magnitude (decreasing brightness). The ragged assembly here is the result of small numbers, always a bain to good statistics. Nature shows us what she wants. Naked eye stars are bright because they are truly luminous. Like much of the rest of the sky, the set is dominated by class A and F dwarfs and class K and M giants. Of the 11 stars presented here, the least luminous still radiates five times the solar rate. Sunlike stars (like dim R Cephei shown in the labelled picture) are just too intrinsically faint to show up. Copyright © James B. Kaler, all rights reserved. These contents are the property of the author and may not be reproduced in whole or in part without the author's consent except in fair use for educational purposes. Thanks to visitor number .